Thanks for posting on my blog. I am thinking about organizing an "Oklahoma Wine Tour" of the various state winerys. We'd rent a chartered bus so someone else could do the driving. That sounds like great fun, Lynn. In my experience, 3 or 4 wineries in one trip is the limit. Oklahoma wineries carry so many different varities that i start wanting a nap after the third one! 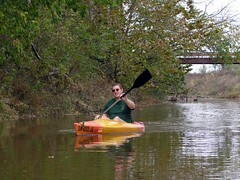 Hello, just moved back to Oklahoma - sold the house in New Mexico and want to start kayaking. I kayaked a bit in Hawaii on the ocean and not only loved it but it also seemed to just fit naturally with the way my body works, if that make sense. I went quite a few times, eventually hours alone -- but its been awhile. I am ready to make the purchase but have no idea even where to begin. I've been following your blog for sometime now and would appreciate any advice.